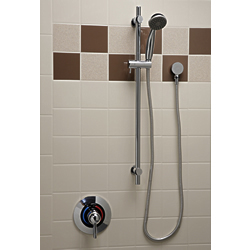 Standard valve package includes Symmons 15-1 pressure balanced 3-port mixing valve with adjustable stop screw to limit handle turn, standard 28" polished stainless steel glide bar and 2-mode eco-friendly chrome on/off hand held shower, 60" stainless steel hose, supply elbow and vacuum breaker. SYMMONS PRODUCTS MEET ANSI A112.18.1M, EPA '92 AND ALL KNOWN FLOW RATE REQUIREMENTS. Showerheads and Hand Showers 2.0 GPM (9.5 L/min). Please Note: Concealed piping and fittings not furnished by manufacturer.